Re-reading the original Sherlock Holmes stories. The Dancing Men is one of my all-time favorites. Facts of the case: A man named Hilton Cubitt comes to Holmes with a puzzle. He’s recently married a woman with a shady past, and someone has been leaving him odd drawings of stick figures in dance-like poses. 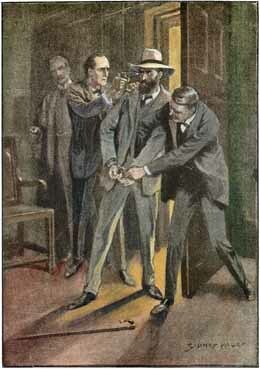 While Holmes works on the puzzle, Hilton and his wife are shot. 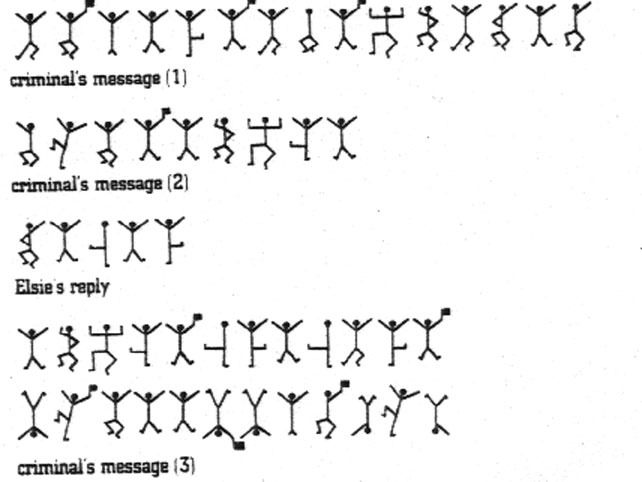 Holmes deduces that the stick figures are a cypher. He cracks the code, and goes after the killer. 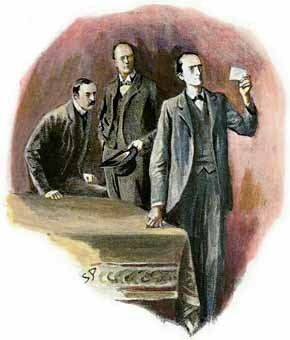 Great detective: Two weeks pass between the time when Holmes meets Hilton and his solving the case. During the time, he works on the cypher. Here we see Holmes actually doing the work of working the case, rather than deducing everything automatically. Good doctor: The story begins with Holmes figuring out Watson had not invested in “South African securities.” I guess this is him managing his finances now that he’s sold off his medical practice. Action hero: Not only does Holmes use the cypher to outsmart the killer, but he’s ready for the killer when he arrives, clapping his pistol to the killer’s head as soon as he walks through the door. Yes this is canon: While working on a chemistry experiment, we’re told that Holmes ties his hair into a top-knot at the back of his head. So, how long is his hair normally? Indubitably: Great fun. All the stuff about Holmes figuring out the code is written in such a way that readers at home can figure it out alongside him. The murder mystery on top of it just adds to the excitement.